From January 20 to 24, 2014, Annals continued a successful collaboration with an academic Web site, Academic Life in Emergency Medicine (ALiEM), to host another Global Emergency Medicine Journal Club session featuring the 2013 Journal of the American Medical Association article "Clinical Decision Rules to Rule Out Subarachnoid Hemorrhage for Acute Headache" by Perry et al. 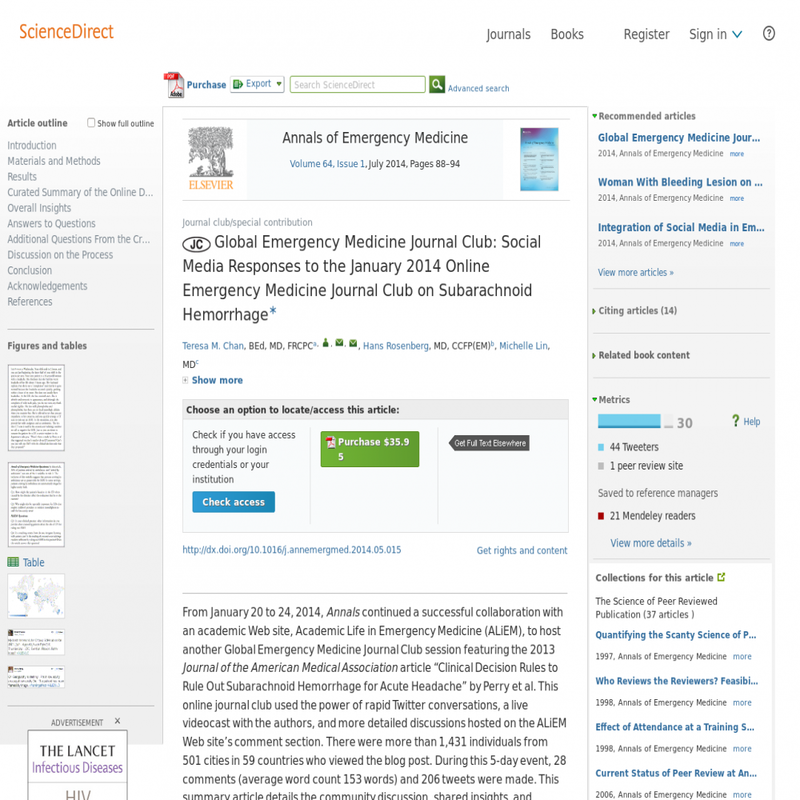 This online journal club used the power of rapid Twitter conversations, a live videocast with the authors, and more detailed discussions hosted on the ALiEM Web site's comment section. There were more than 1,431 individuals from 501 cities in 59 countries who viewed the blog post. During this 5-day event, 28 comments (average word count 153 words) and 206 tweets were made. This summary article details the community discussion, shared insights, and analytic data generated during this novel, multiplatform approach.